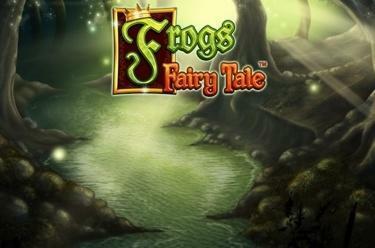 Play Frogs Fairy Tale™ online for free now! Green is not just the colour of hope but it is also the colour of our little friend which will turn gold coins, jewels and much more into Twists at Frogs Fairy Tale™! 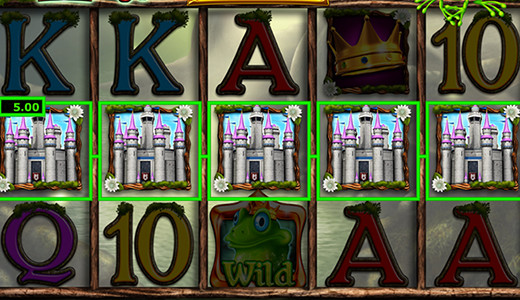 Stroll leisurely through the dreamy fairy-tale forest to fill your player account with the help of our lovely frog king. With a little luck you will discover the bonus pond covered in water lilies, which hides a jackpot and one or two feature games! Your aim: 5 matching symbols along the 20 win lines. You win with 2 crowns or 3 other matching symbols if they land from left to right along a line without interruption. The water lilies trigger a win regardless of their position on the reels. The frog substitutes all symbols except water lilies. Free Spins You play 5 free games on 'enchanted' reels. The princess appears as a Wild symbol during the free game. If the princess and the frog appear in the same round, the frog will be turned into a prince with a kiss. Enchanted Stream Bonus: With the help of multipliers you will move our frog to a golden ball. Depending on how far you get you either win a multiplier or the golden ball bonus. Colossal Reel Bonus: You play on an extra set of reels and the first 3 reels have been swopped with a mega reel, which gives you a guaranteed win on all 20 lines. Princess Prize Bonus: Our princess sends you a kiss and a random win. Even the frog king is sometimes hungry - when the reels are spinning our little friend sometimes gets an appetite for flies. If he is successful a bonus multiplier increases with every swallowed fly. As soon as the reels stop your win will be multiplied with the total multiplier. Numerous different bonus features and jackpot possible!